Today in forex trading the GBP/NZD had a trading alert for a buy on The Forex Heatmap®. The New Zealand Dollar (NZD) was weak on all pairs. Since the British Pound (GBP) also had some strength this pushed strong upward movement on the GBP/NZD for traders. The JPY also had some strength today. This caused the NZD/JPY to drop very hard today as the overall drop has pushed this pair into one support level, we would be scaling out lots at this price level. The NZD weakness also pushed the NZD/USD strongly lower, this pair is still trending down and should continue lower from here. The Forex Heatmap®, shown below, gives live trading alerts for 28 currency pairs and can be used for trade entry management and improving your overall profits when trading currencies online. The trend chart below indicates that the NZD/JPY is cycling down on the D1 time frame. Current support level is at 86.25, you set a price alert at this price. Below there we would look for a sell signal on this pair on The Forex Heatmap®. If this pair breaks lower the target support area is around 84.75, or about 150 pips below the alert price. The charts you see below are 5/12 exponential moving averages on meta trader. Today in forex trading the JPY was weak on all pairs. This dive strong price movement on these pairs. The NZD/JPY made a strong move to the upside. 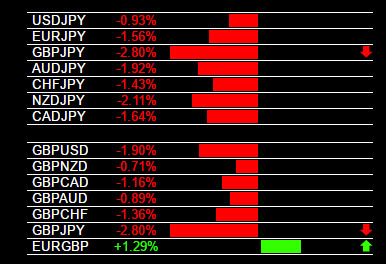 Other pairs like the EUR/JPY and CHF/JPY also broke higher. These pairs have and have no nearby resistance on the larger time frames, so you can continue to hold. The trading signals you see below are from The Forex Heatmap®, a real time map of the forex. 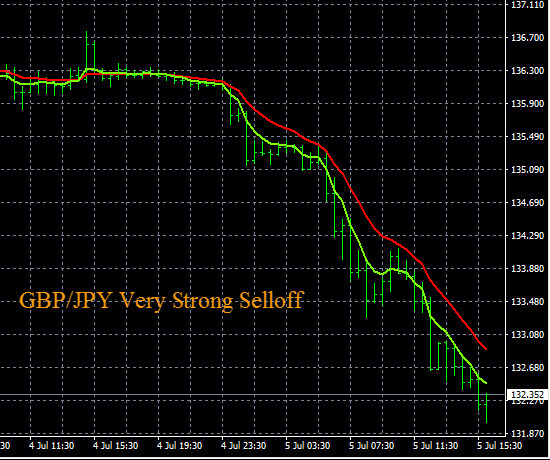 Today in forex trading the JPY (Japanese Yen) was weak on all pairs, driving these pairs higher across the board. The signal system shown below is The Forex Heatmap®. Some pairs like the CHF/JPY broke to new highs and have no nearby resistance. Other pairs like the EUR/JPY and NZD/JPY are approaching breakout points and we will be evaluating this group of pairs to plan further buys on some trending pairs in the JPY group. The Forex Heatmap® is an easy to read signal system for forex traders. You can see how the heatmap is laid out with one heatmap on the left for the Asian session and one on the right for the main trading session. The heatmap signals are easy to read, even for beginner forex traders, and reliable trade entries are possible for the JPY pairs when you see strong strong signals like this. Compare the heatmap signals to widely used forex technical indicators and you will strongly prefer the heatmap for guiding profitable forex trading. The image above shows the JPY pairs, but the heatmap works for 8 currency groups and a total of 28 pairs. Traders can enter trades on trending or ranging pairs with this great entry management system.